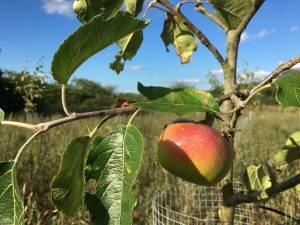 Since our last AGM scions have been taken from the Wareham Russet apple tree in Tower Lane and from other Cheshire heritage apple trees growing in the Trafford Drive Allotments Community Orchard. Harry Delaney and students at Reaseheath College grafted these onto rootstock for us and the resultant potted saplings were carefully nurtured by Jacquie and Brian Williams. 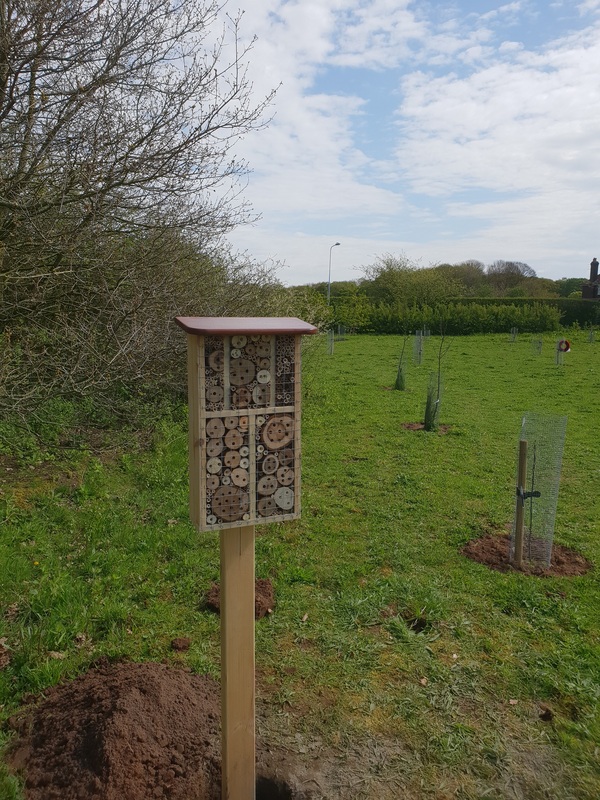 Some of the Wareham Russets have been planted in the grounds of local schools or in private gardens but, together with the other Cheshire heritage trees, most were planted in the Memorial Orchard. As usual our sturdy band of volunteers continued to work hard weeding, replacing our original stakes with longer and stronger ones, keeping the paths clear and picking up litter and dog poo. Then came the long hot summer; great for those who enjoy sunbathing! Unfortunately the drought was not enjoyed by our young saplings. I am therefore especially grateful to the volunteers who spent hours filling water containers, taking them to the orchard and watering the trees with watering cans. 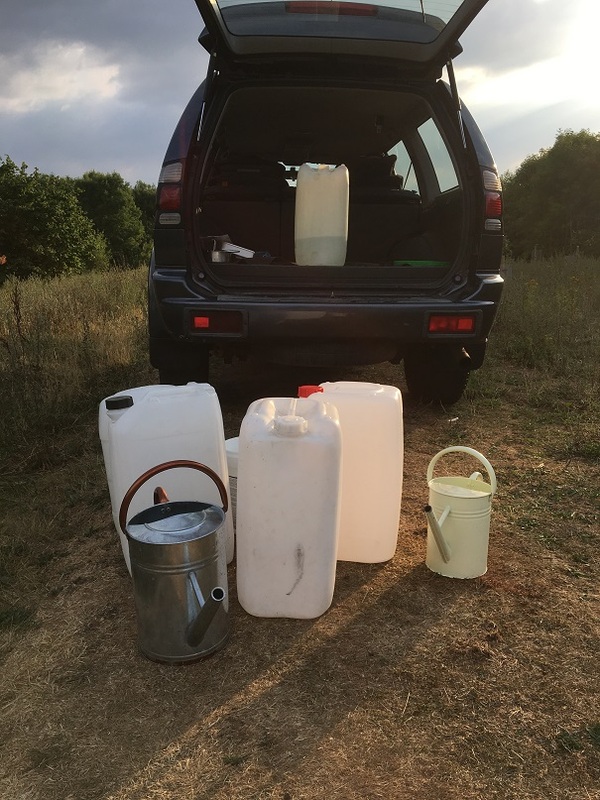 Believe me those full water containers were heavy; I couldn’t even lift one! Despite their efforts we lost a few trees but this was not due to lack of water so much as vandalism. 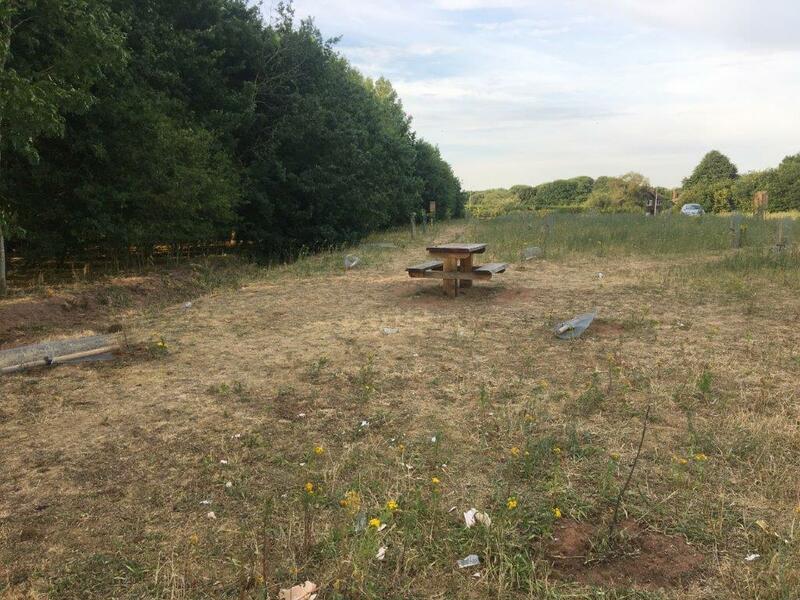 Our policy is to rectify damage as quickly as possible so that vandals do not receive any encouragement from perpetrating their crime, and also to minimise the risk of copycat crimes. Damage to benches was rectified with a sander and even, on one occasion when the graffiti was deep, with a plane. However, when young trees are uprooted, and in some cases broken, there is little we can do except to remove the evidence. Stakes were broken and wire netting animal guards thrown around. We are very grateful to P.C. Matthew Hood who has visited the orchard frequently with either PC ClaIre Murgatroyd or PCSO Nicola Devey. On one occasion, when they wore plain jackets instead of uniform jackets they were able to apprehend three young men. However, they believe that much of the damage is being caused by 11 and 12 year olds whom they have yet to catch in the act. We are also grateful to walkers who have reported the damage either to us or to the Woodland Trust. One of the two Bee Hotels! Fiona and her dad, John Casson made two beautiful bee hotels. 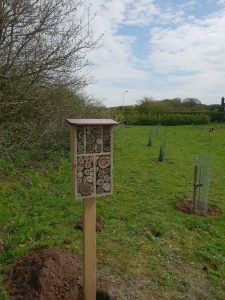 Solitary bees gave them a 5 star rating when they laid their eggs and blocked the entrances with wax within days of the bee hotels being installed at the orchard. 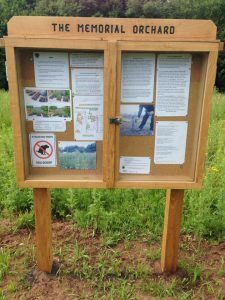 One of these too was vandalised after the young bees had left, but fortunately the damage was readily rectified. Darren England continues to send us photographs of the war graves of some of the soldiers mentioned on the Weaverham War Memorial and even one of Private Arthur Gregory’s death penny and another of his medals. 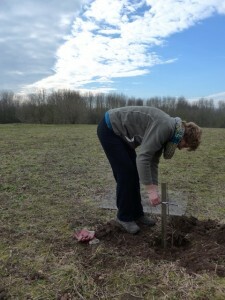 Tom the Appleman visited the Memorial Orchard and was very impressed. 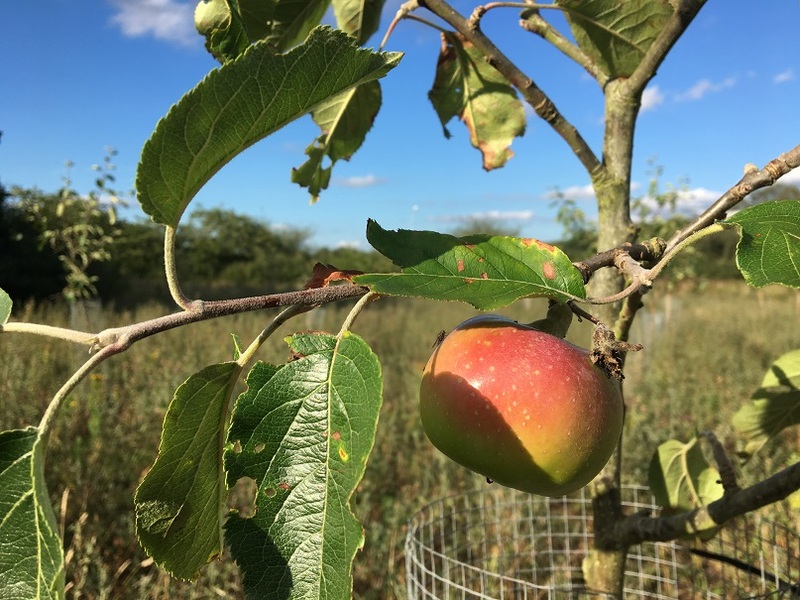 He took some buds so that he can propagate the Wareham Russet and some other Cheshire heritage varieties for his own orchard. He has offered to graft scions onto rootstock for us when required. 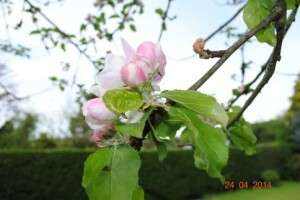 Crispin Spencer, the head gardener at Trafford Hall, invited us to visit the Hall’s orchard. It was an interesting and useful visit. 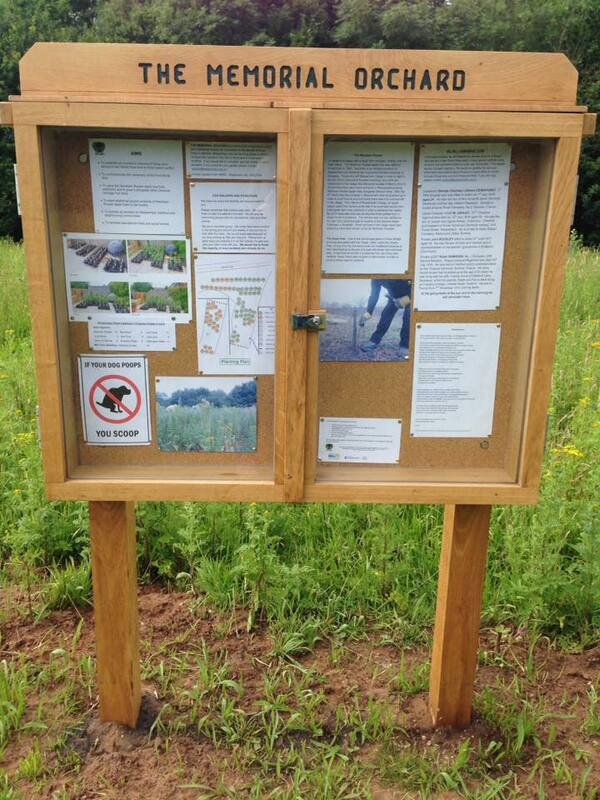 Usually our notice board is divided into two sections. 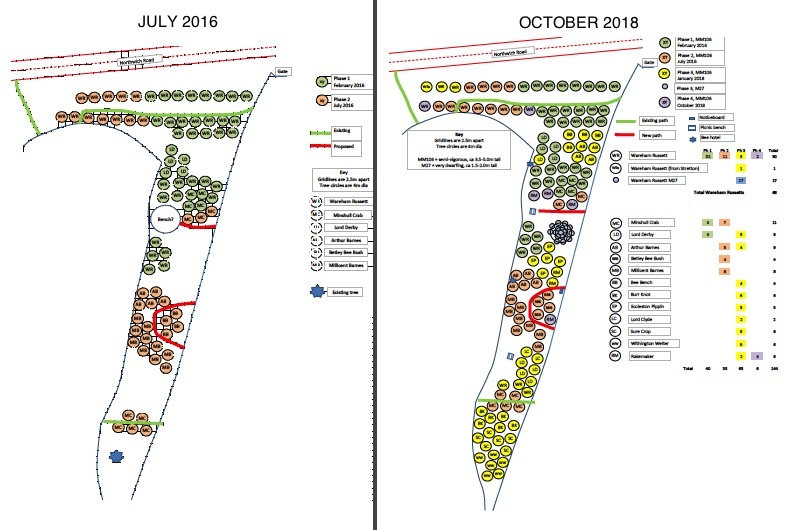 The left side shows our planting plan and gives information about the different apple varieties. The right side is an In Memoriam section. 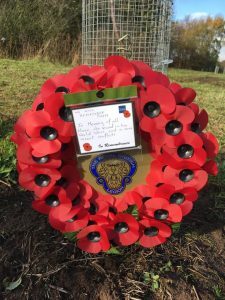 This is changed approximately every two months and gives some information about the men mentioned on the village memorials in Weaverham and Hartford as well as those buried in Commonwealth war graves in the churchyards and who may not be named on the memorials. We want them to be remembered as young men with families and not as a list of names. We also like to feature their comrades who survived war. Nobody who has fought in a war can survive unscathed. It was therefore a joy to meet 93 year old Ernie Nelson with his family reading our notice board. We were able to have a chat with him. He served in the Royal Navy as a wireless telegraphist during the Second World War and was a veteran and survivor of the Russian Arctic Convoys and of the D-Day Landings when his ship escorted the mine sweepers. 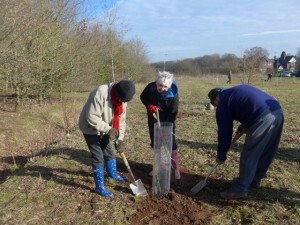 Our volunteers have recently planted a few more saplings and we now have 144 Cheshire heritage apple trees growing in the orchard, but what of the future? We are a little concerned about a few young trees which suffered in the drought and which may need replacing at a later date. 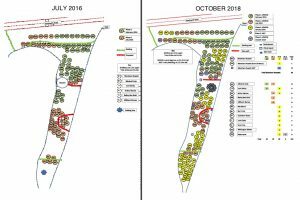 Brian continually updates our planting plan which is a great help and we expect to plant Hazel Pear trees and Cheshire Prune/Damson trees next year. Thanks to Fiona we now not only have a website looked after by Steve but we are also on Facebook. We continue to contribute to the Weaverham News and the Hartford News and Steve regularly e-mails a news bulletin called Russet to our supporters. 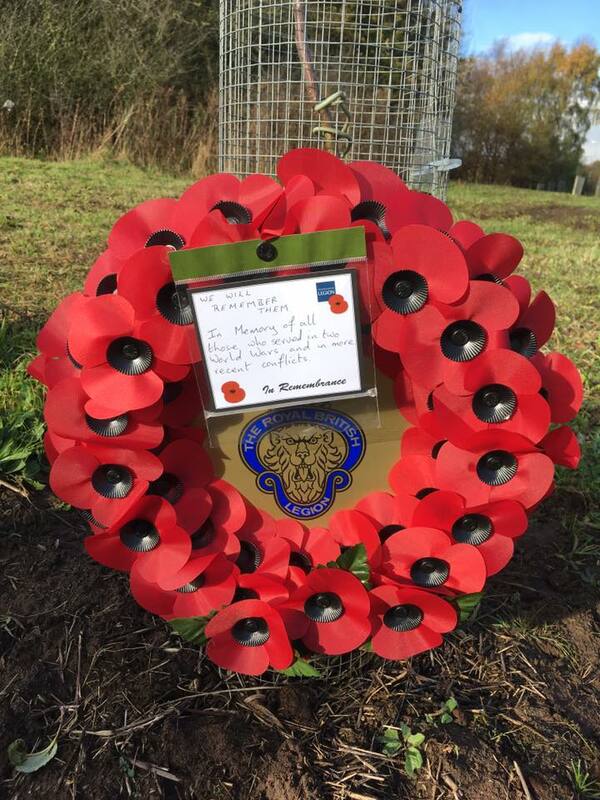 Last November we quietly laid a wreath at the orchard and will continue to do so in future years. However, this year marks the centenary of the signing of the Armistice which effectively ended the First World War. We will mark this by holding an Ecumenical Service of Remembrance at the Memorial Orchard on Thursday, 15thNovember at 10.45a.m. The service will be led by Fr Paul Standish assisted by Revs Mike Smith, Chris Pritchard and Paul Withington. Members of the Royal British Legion will be laying a wreath. By kind permission of the head, parking will be available in the Grange School sports field car park. Unfortunately the wrong time was given in the Weaverham News. The time has been brought forward so that the two minute silence could take place at 11.00a.m. We do hope that as many local residents as possible will be able to attend. 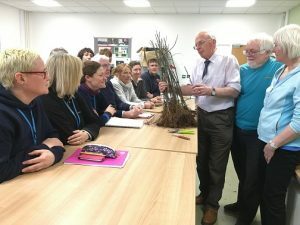 I would like to conclude by thanking Neil Oxley of the Woodland Trust for his continued support and all our volunteers who are not members of the Action Group but turn up when help is required like dealing with ragwort or watering trees. I am particularly grateful to Geoff Hornby and Rob Lloyd who help on a regular basis and work really hard planting, weeding and staking etc. 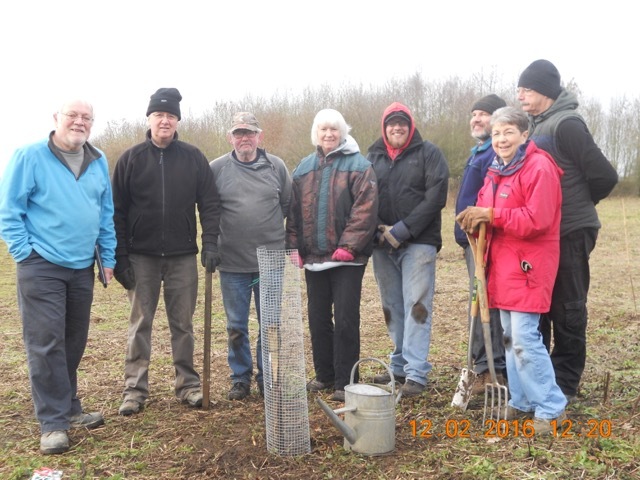 I also want to thank the Action Group members who work tirelessly in many different ways both at the orchard and behind the scenes: Fiona Casson, Steve Doughton, John Freeman, Mike Hornby (secretary), Peter Sayers, Brian Williams (treasurer) and Jacquie Williams. Finally, I would like to thank all of you for your continued support and for coming here this evening.